Welcome to the Interpretation Canada blog! Our organization is a learning community. We encourage respectful dialogue in the comments section. To comment you must be logged in and a current member. We encourage members with big ideas to write for us. If you're interested, check out the guidelines here. Bob Townsend was a young university student when, in 1968, he was hired as Cypress Hills’ first Interpretive Naturalist. At the time, I don’t think he thought of himself as being a pioneer for the Alberta Parks system; nor does he know that whenever I see him or think of his story, I picture him as a lodgepole pine tree. When I worked in the Cypress Hills I was fascinated with the succession that was occurring on the Hills’ plateau. The Cypress Hills are like a bald man’s head: the slopes are forest covered and the flat top is covered with fescue prairie. The key difference is that, unlike the man where he is losing more and more hair up top, the pine forest is reclaiming that turf. This is in part due to the absence of wild fire and the natural process of succession. I remember countless examples of pioneer pine becoming established in the grassland. They reminded me of those old black and white family photos where the children were lined up shoulder to shoulder from shortest to tallest. 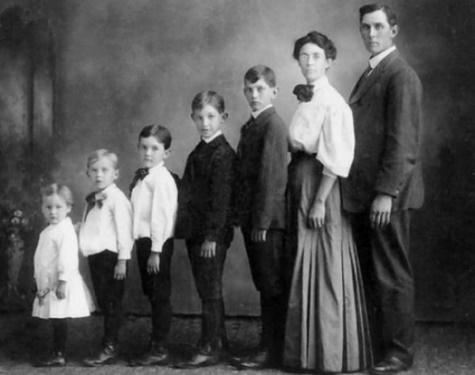 Naturally, the mother and father assumed their respective places on the tallest side. Here in the Hills, the first pine to become established in the grassland would be a stand in for the tallest parent, and ordered typically in a down-wind sequence were other pine of decreasing height and age. It wouldn’t have been easy to be that first pioneer pine. The Cypress Hills’ plateau is a harsh environment pummeled by wind and frequent storms year around, and at times extended periods of drought and heat. But once that first pine was in place, once the foothold was established, this first pine created an easier environment for the next, and others that followed. 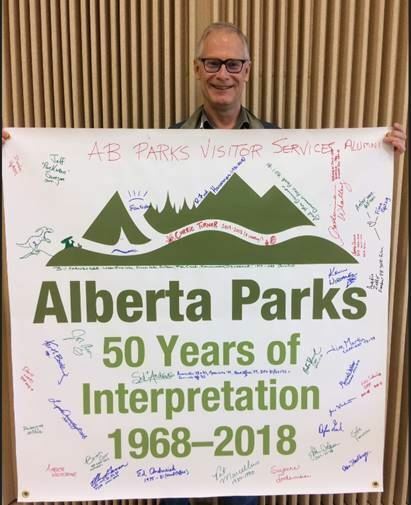 In 2018, Alberta Parks’ celebration of 50 years of interpretive and educational services recognized our early pioneers. Bob Townsend was the first hired into a dedicated naturalist position in the summer of 1968 in these same Cypress Hills. I often pictured him like one of those pioneers who against all odds became rooted like a pine tree in the Hills’ grassland. Bigger picture, Alberta Parks was part of the larger national and international efforts at expanding interpretive and educational services within federal, provincial and municipally operated parks across the globe. Parks Canada had formally established their program in the late 1950s and Ontario and BC Parks were also forerunners in providing these services for park visitors. So, playing on this ecological parallel, it was sort of like convergent evolution. It had become a good time to launch these services in this continent, country and province. In the second half of 2017, the Alberta Parks Visitor Experience Coordinating Committee grabbed-on to the idea of celebrating our 50th anniversary; a plan embraced by our program area staff and managers. A 50th anniversary logo was developed and utilized on banners, email signatures, nametags, internal documents and other materials. A Facebook group was also established for past and present staff as a forum to share stories, pictures, information about a potential reunion and celebration plans. The Visitor Services Alumni also bridged with the Alberta Parks Alumni for awareness and sharing information through their membership. The celebration was launched at the spring Interpretive Training workshop in early May at the William Watson Lodge in Kananaskis Country. The 50th anniversary theme was front and centre – workshop leaders were dressed in uniforms of former eras, and a couple of workshop sessions were led by retired or semi-retired Visitor Services alumni. These folks shared experience and expertise with the full love and caring of mentors who had decades earlier been in the same place as those in attendance that day. 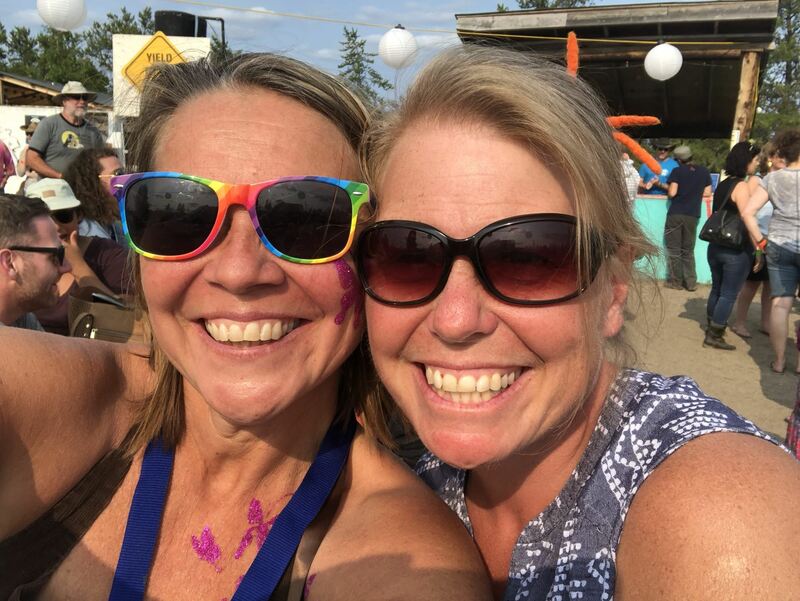 Throughout the summer of 2018, the anniversary was recognized and celebrated across the province. The 50th anniversary banner was displayed proudly at park Visitor Centres and at programs and special event locations. A team of Interpreters from Kananaskis Country provided out-reach programming at one-half dozen sites including Canada Day celebrations on the Provincial Legislature grounds in Edmonton. September saw one of the key events of the anniversary unfold at Dinosaur Provincial Park. A reunion campout was enthusiastically embraced by 40 or so past and present staff. In short it was a delight: demonstrations of interpretive services and behind the scenes tours, lots of laughter and story telling! Two of the outcomes of our campout were to carry on with a semi-formalized alumni and to set our goals on our next reunion activities including a campout in two years time. In many ways, the formation of an alumni has been one of the biggest achievements. Our membership by the end of 2018 was over 250 past and present staff. Personally, one of the most joyous observations was the easy gathering of present and past staff to ask questions, gain multi-generational insights and to hear of the experiences and challenges those in trenches today face. A commitment was made to look at ways for continued engagement between the alumni and present program staff – such things as leading sessions at the annual spring workshop, as was done earlier in the year, and through professional development of permanent and long term staff. I started a journal of sorts in 2018 with notes from impromptu interviews of our “pioneer pines”. Bob Townsend and I have remained friends and I did see him following the campout – but others made their way into the pages as well. My questions were these: how did this all unfold and what were the driving forces behind the Visitor Services program in those early days? What drove the program and the staff? The observations and stories shared will be incorporated into a blog in the near future. A recent visit to the Cypress Hills left me surprised at how common lodgepole pine seem to be on the plateau. As well, there seemed to be more mature trees now that were showing signs of their age: dying and broken limbs, and cones a-plenty. It made me laugh. True story, one amphitheatre character I once played was an old crabby pine tree that couldn’t wait to “pass-on”, preferably by natural forces like a wild fire, so that it could open its cones and start a whole new generation of little ones. Maybe in fact its wish has come true. Let’s check back in another 50 years and see how the place looks. Keith Bocking is the Parkland Area Manager for Alberta Parks' Central Region. I’ve been an interpreter specializing in school programs for almost 20 years, and throughout my career I’ve heard (and, let’s be honest, made) a wide variety of complaints from my coworkers about the difficulties presented by working with teachers in a field trip setting. About 8 years ago, I pursued an Education degree. Becoming a certified teacher gave me useful insight into a lot of the teacher behaviour I’d previously found mystifying. As it turns out, a lot of ‘problematic’ issues with teachers are really just caused by miscommunication. Here are some tips that I’ve found useful for improving communication with teachers and working with teachers on field trips. 1) Communicate with teachers before they arrive. Once the group is on site, teachers will be focused on their students, as will you, and it will be too late to pull the teachers aside to ask questions or request help. So, it’s important to touch base about this well before the visit. What this looks like will vary. It’s harder to communicate with teachers if someone else handles your bookings, but providing some handouts with field trip expectations that can be shared with teachers at the time of booking is helpful. For longer programs – overnight camps, full day field trips, multiple visits, it’s not unreasonable to offer some kind of orientation session for teachers. Consider for a moment what it takes to successfully bring an entire elementary school class to your site. Before arriving at your site, Mrs. Jones may have already printed and handed out nametags, tracked down missing permission slips, arranged parent chaperones, escorted students to the washroom, borrowed jackets from the Lost and Found for the kids who arrived unprepared, organized their class onto the bus, and tolerated a bus ride with 24 excited 8 year olds before they even walk in your front door. Greeting them at the door when they arrive, being organized, and perhaps even offering Mrs. Jones a chance to run to the washroom before you get started can really help them feel at ease, and be on your side, for the remainder of the visit. Remember, teachers are visitors too. When referring to the teacher in front of their class, by all means call them “Mrs. Jones” or whatever their teacher name is. But, if you are just talking one on one - answering a question during a snack break for instance, knowing that Mrs. Jones’ first name is Jessica can really help establish a rapport. You know those teachers who hang out at the back of the group and don’t help you control their class? They may just be worried about stepping on your toes. In the school environment classroom teachers often send their classes off to specialty teachers for music, or 2nd language classes, and interrupting those teachers to discipline their class would be considered rude. If you want a teacher to help you manage their class, you often actually have to give them permission to do so. A quick “Hey, Jessica, just so you know I’d love your help managing your class – feel free to intervene if they aren’t behaving up to your expectations” before the field trip starts can make a huge difference in how the teacher works with you. When the group arrives, take a few minutes to observe how the teacher manages their class. How do they line up? Are they in partners? Does the teacher have a specific way of getting her student’s attention? Are they asked to raise their hands, or is shouting out tolerated? Classroom routines are a very important part of managing a class, and can take a long time to establish. Unless there is some program or site-related reason to change things, following the routines the children are already used to – like lining up in partners rather than single file - can save you a lot of unnecessary frustration. Why has the teacher booked this trip? If you don’t know the answer to this question, ask. The group may be at your park because they are specifically interested in learning forest ecology, but it’s also possible that the teacher has some other goal, like giving her class practice interacting with their community, gathering inspiration for a writing project, or just getting her class outdoors for a fun reward. Knowing the teacher’s goals up front means you can help achieve those goals. Yes, this may mean letting go of your own plans, but it also means satisfied teachers who are more likely to book field trips in the future. In Canada, educational curriculum is established at the Provincial level, and is easily available online through your relevant government ministry. Knowing curriculum honestly won’t help you much once the group has already arrived, but ensuring that your programs are linked to curriculum will help your programs across the board. And don’t just focus on science or social studies. Sure, your science centre has some obvious science curriculum links, and your historic site links to social studies, but can you also support the class in their math, art, or language arts goals? Teaching is an incredibly difficult job, and the few hours the class is at your site is only a small snapshot of what Mrs. Jones may be dealing with. Sure, it’s annoying if teachers are disengaged, answer their phones during field trips, or fail to keep students in line, but it’s important to keep the big picture in mind. The phone call may be important. Students may have individual learning or behaviour plans in place that you aren’t aware of. If all else fails, just remember that teaching is an even harder job than interpretation, and communication is key. The more you can establish relationships with teachers who bring their classes to you, the easier the field trips will be... and the more likely they are to return. Pam Murray is a certified teacher and the current Chair of Interpretation Canada. She has been delivering school programs in nature centres, parks, and currently at Milner Gardens & Woodland on Vancouver Island, for 20 years. When was the last time that you laid in the grass and watched the clouds drift by? For me, it was the afternoon of Sunday, July 8, 2018. If you want to know when the last time that I did that before July 8, I wouldn’t even be able to guess. 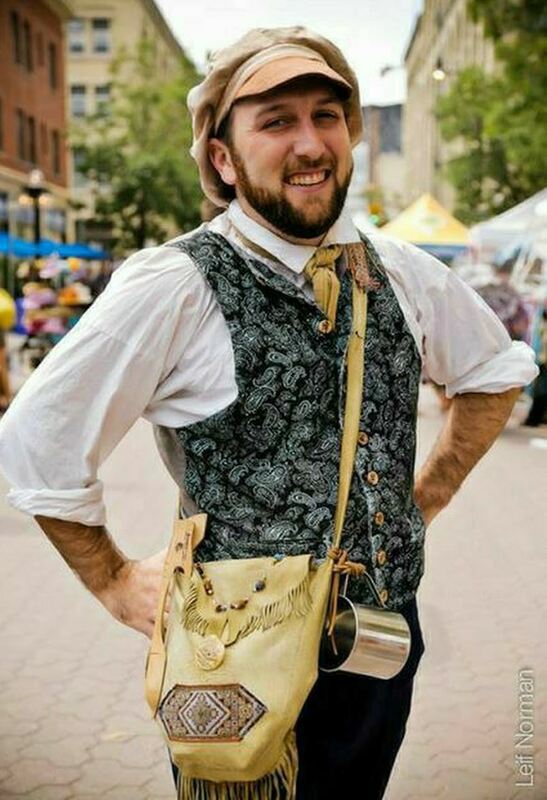 When I posted about the experience on social media, that Sunday in July, someone commented that it sounded like I had been sauntering, and shared a link with me: https://vault.sierraclub.org/john_muir_exhibit/life/palmer_sauntering.aspx . That excerpt from john Muir really resonated with me. While on a hike in late spring this year, I pointed out to a visitor how prolific the wild roses were this year. They asked me if they smelled like regular roses. I was about to answer, but I paused… I couldn’t remember. ‘What did a wild rose smell like? When was the last time that I actually went and smelled one?’ So instead of making some excuse and then rushing off, we went over to a plant together and smelled the blooms. We discovered that the wild rose has a lovely fragrance. It was a good reminder to me that in my role as interpreter I don’t necessarily need to be rushing off to the next part of the script. We need to allow time for discovery - to give people the opportunity to connect with the landscape. We didn’t discover anything extra with the flower this time around, but one time when I stopped to photograph a wild rose while on a walk, the one that I happened to stop at had a small white spider stalking along the petals. I later discovered that it was a goldenrod spider Misumena vatia, which is known to feed on bees and other insects as they come to pollinate the flower. This summer at Dinosaur Provincial Park, we offered a few night sky programs during the Perseid meteor shower in August. I tagged along on one of the nights because the spot that the program was happening was a great spot for night photography, not just looking at the night sky. The interpreter that was running our night sky Perseid program this year told me that she always has trouble with that sort of interpretive program because she is so used to doing a lot of talking on interpretive programs. I feel like the night sky program was an opportunity to allow people to connect with the night sky at their own pace. Provide some star charts, point out a few interesting features/constellations, occasionally call people who may be interested over to check out something cool in the telescope, but mostly just sit back and allow the visitors to facilitate their own experience. So take time to smell the roses (or photograph them), lie back and watch the clouds drift by, find a spot with a good view of the sky and lose yourself in the stars. You never know what you’ll discover, and what you may inspire. 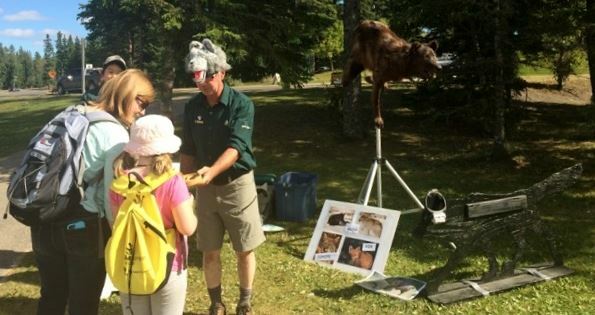 David Lloyd has worked in various interpretive roles since being hired as a seasonal interpreter in Banff National Park in 1999. He has been the Guided Excavation Coordinator at Dinosaur Provincial Park, for the last seven summers, where he teaches members of the public how to dig up dinosaurs and takes group hiking in the badlands of southern Alberta looking for fossils. Although the setting may vary, the educator’s role when guiding inquiry-based learning does not change much. The lines of questioning that will guide any group of learners towards the wanted learning outcomes are very similar in any given environment. The following example will demonstrate how the guide may ask the group of learners the same questions in an inquiry-based learning system when in an indoor setting, an outdoor setting or an imaginary setting. This approach to inquiry-based learning is effective for all age groups including adults. Educational Goals: Become familiar with how a canoe functions. Discover what materials may be used to build a canoe. Give examples of how canoes have been used traditionally compared to how they are used in modern times. Indoor classroom setting: Have the learners organize their seats into the shape of one or more canoes. Outdoor setting (with real canoe, paddles and life jackets): With the canoe out of the water, have the students stand around the equipment. Let them pick up a paddle and put on a life jacket at their own pace. Let learners who are familiar with the equipment show others by asking them to demonstrate. Continue this first canoe lesson out of the water as it will help the learners focus their interest on the actual craft and relevant objects related to the wanted learning outcome. Imaginary setting: In an empty space, have the learners imagine the shape of a canoe and make-believe putting on life jackets and picking up paddles. Does anyone know what a canoe is? Who here has been in a canoe before? If we are to board a canoe that is in the water, what do we need to wear? What do we need in our hands to guide the canoe? How do we move the canoe over land? How do we navigate it on the water? How do we make the canoe go straight? How do we make it turn? How were canoes made in the past? What are they made of today? What advantages does one material have over another? What were canoes used for in the past? What are they used for today? Are there any others things to know, or are there additional tools and equipment needed in the canoe to ensure the safety of the paddlers? Does anyone know a good paddling song they could teach the group? Ask the above questions. Allow enough time for individuals to answer the questions out loud to the larger group or break into smaller groups to research a topic related to the questions. Allow time for the small groups to share their findings with the larger group once gathered again. Let the learners try things out, they may even create props for paddles, life jackets, even voyageur sashes. Let them demonstrate to each other how to paddle or portage the craft. Encourage research of different kinds, either by using screen technology, books, or even contacting experts. Have the group board the canoe pretending that it is really on the water. The guide ends the session by joining the learners in the canoe. Once the group agrees that the educational goals have been reached, let emotions run high while the whole group sings and paddles together. Please visit TiBertvoyage.com for more lesson plan ideas! During the first week of July, my fellow museum educators and I spend three days roaming the Peace country of Alberta with Derek Larson, our resident palaeontologist, looking for dinosaur bones. Day 1 involved precariously shimmying our way along a high, steep riverbank in the heart of bear country looking for fossils in the underexplored Dunvegan Formation. Day 2 saw us strewn across the ground, under the hot sun, looking for tiny microfossils in the badlands of the Kleskun Hills. Day 3 had us crouched in thick, sticky mud along a well-known creek bank digging fossils from one of the world’s most famous dinosaur bonebeds. As a non-scientist, my experience with professional fieldwork is not very extensive. For half of our summer interpreters- university students working on their science and education degrees- it was the first time they’d ever done anything like that before. So why would we leave the comfort and safety of our museum classrooms to venture out in search of fossils we’ll likely never do any research on ourselves? I believe authenticity is more desirable than scripted information in interpretation. I’ve been in this line of work at one facility or another for five years now, and I’ve met a lot of interpreters. Many people in this field have a genuine passion for what they talk about, and often go out of their way to learn more and become further immersed in it. An all-too-common sight in our field is the interpreter who learns the standard material, knows how to smile and speak clearly, memorizes the program scripts but doesn’t go any further than that. Now, having these public speaking skills and other professional abilities is obviously essential to what we do, but I believe that interpretation can be much more than just impersonal recitation of the facts. It’s one thing to read about the subject you talk about. It’s another to actually do it yourself… to get your hands dirty in that world… to be the real thing… even if it’s just for three days. Obviously we shouldn’t expect ourselves to become academic experts in our chosen fields. Our role is to speak about science, art, history, etc. on behalf of those who spend their lives doing those things themselves. But there’s no reason why we, as interpreters, shouldn’t try to become as immersed as we can in what we teach about. As much as we gussy up and over-think our jobs, at the end of the day interpretation is simply the art of explaining the meaning of something. We put the technical language of arts, culture, history, and science into words the public can understand and appreciate. Imagine if you wanted to have a conversation with someone who only spoke Japanese, and you needed an interpreter to help you. Would you go for a person who, while speaking perfectly serviceable Japanese, had never been to Japan themselves? What if you had the option of someone who had actually lived there, knew the language, the customs, the culture…. I think the choice is pretty obvious there. We took our interpreters out for three days of fossil hunting because it wasn’t enough for them to simply hear about what the world of paleontology is like. They had to live it: to know how to use a geologic hammer, to know what a field jacket is, to know how hot and thirsty the dusty badlands make you, to have stories to tell about the prehistoric treasures they found. Your audience is going to ask you tough questions. They want a deep well of knowledge, not a shallow pool. They’re going to remember honest and engaging stories from someone who has actually experienced that life, not paint-by-numbers scripts and cookie-cutter responses. So get out there, already. Talk to experts, see if they’ll take you behind the curtain. Visit other facilities and see how they do things, even if they have very little to do with the subject you interpret. Learn everything you can about as many things as you can. Make friends with other interpreters (if you’re an IC member you’re off to a good start). Follow up “I don’t know” with “but I’ll find out”. Be genuine and enthusiastic, and don’t try to hide that. Know your stuff. Be the real thing. In recent years, those of us who work in interpretation , or in the broader field of visitor experience, have been waking up to the idea that we need to get off the stage and listen to our visitors more. We may call it participatory interpretation, dialogic interpretation, ‘guide on the side’, or ‘STFU’, but when it comes down to it, these philosophies all point to the same idea – that we need approach interpretation as well-informed facilitators of experiences, rather than know-it-all experts. And yet, in many sites across Canada, from September through June, groups of visitors continue to be enrolled in tightly planned, agenda-driven programs with precise learning outcomes. These visitors are sometimes grumpy about having to listen to long talks, so we make the talks more fun by using puppets, or songs, or jokes. These visitors aren’t always great at sitting still, so we incorporate movement and games. Sometimes, these visitors just really don’t want to participate, so we ask the group to bring along a half-dozen chaperones, in order to ensure that these visitors comply with our directions. We tell the visitors they have to stay on the trail, aren’t allowed to touch the artifacts or the animals, and can’t eat snacks in the theatre. They aren’t allowed to opt out of activities, and there may even be consequences if they do. Over the past 20 years, I’ve planned and presented school programs in parks, museums, and a fish hatchery visitor centre. 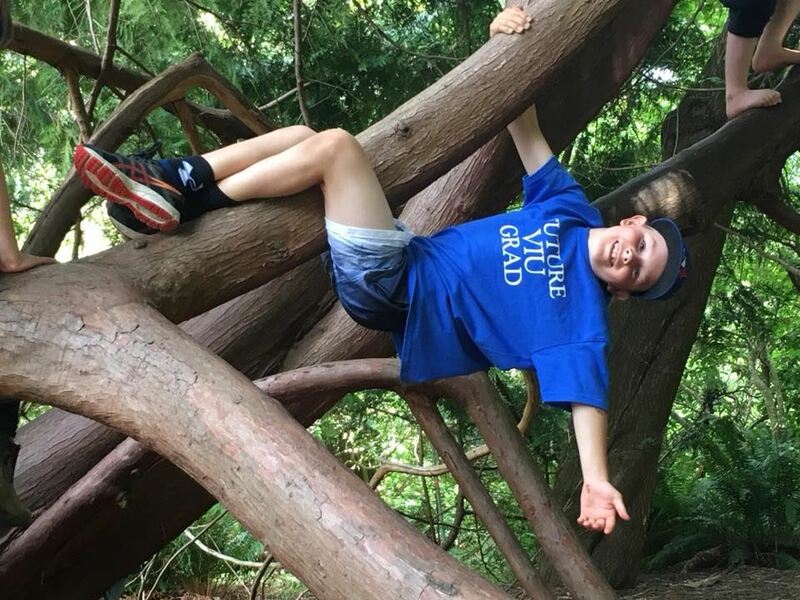 The school programs I currently coordinate, at Milner Gardens & Woodland on Vancouver Island, are different than anything I’ve ever done – mostly because the program was created by folks who didn’t have my preconceived ideas of what school programs are ‘supposed’ to look like. The program consists of a series of five linked visits that are each 2.5 hours long. The students are mostly Grade 1’s. There are no specific learning outcomes dictated by my site. Parent helpers are not allowed, and the programs are offered for free thanks to some incredibly generous supporters and donors. Beyond this structure, I inherited no written program plans of any kind, so it was up to me to build the content of the entire program from scratch. The lack of agenda and parent helpers terrified me at first, but after five years of getting used to the idea, collaborating with teachers, and most importantly listening to my visitors – the children, I’ve come to think about school programs differently than I used to, and am questioning whether everything I thought I knew might have been wrong. I used to think parent helpers, as frustrating as they could sometimes be, were essential. Without them, I realized quickly that I’d been relying on them to coerce children into participating in programs that may not have been as engaging as I thought they were. Without extra adults to help manage the kids’ behaviour, I got immediate and obvious feedback about what my young visitors wanted to do on their field trips. They didn’t want to sit and listen, no matter how funny I was. They wanted to explore the trails, catch bugs in the pond, run on the lawns, tell me long stories about their pets, and climb trees. A young visitor demonstrates what children really want to do on field trips. I also thought my content and learning outcomes were the whole point of a school program, so the complete lack of agenda from my site was confusing at first. Having just completed a teaching degree when I started, I looked to provincial curriculum, and the teachers who attended the programs, for ideas. It turned out that most of the teachers I talked to were more concerned with giving their classes the chance to cooperate as a group, develop their critical thinking skills, spend time in nature, and connect with the community than in any particular science outcome that I might focus on. The first year I relied on nature exploration activities I’d had success with in the past, and planned the year on a seasonal theme, from fall leaves and decomposers in October, to pollinators in the spring. With 2.5 hours to fill, I also allowed a lot of time for snacks, breaks, and free time. I let kids touch and smash the ice on the Reflecting Pool in the winter, jump in the leaf piles in the fall, visit with the resident cat, and yes, even climb a tree on occasion, not because I thought these activities were important, but because the kids enjoyed them and I needed to kill time. I also incorporated a talking stick circle at the end of the session. The conclusion of a lot of my school programs in the past mostly consisted of “…and so that’s why you should save ohmygosh look at the time, thanks for coming, bye!”. I knew this wasn’t effective, so with all that time to spare, I set aside time at the end of each visit to pass a stick around a circle and let each child speak about what they had enjoyed about the visit. If I hadn’t incorporated reflection and free time into my program, I wouldn’t have realized how important these unstructured activities and quiet times were, and how little my agenda actually mattered. But isn’t this what everything else in visitor experience is pointing to? Don’t we all know by now that we need to listen to our visitors more, allow them to share the stage, and be facilitators rather than teachers? It’s time we applied what we know about effective visitor experience to school programs. And yes, I can already hear everyone’s manager chiming in with ‘But our funding says that we have to..’ and ‘You can’t eliminate parent helpers!’. We may not be able, as individuals, to make institutional change, and I recognize how lucky I am to run a program where I’m allowed to do school programs this way. We do all, however, have control over our own attitudes, and it’s high time we started thinking of children as visitors too. We need to spend more time in school programs listening to children, allowing them to reflect on their experiences, and facilitating exploration, inquiry, and play. We need to de-program school programs, and improve our young visitors’ experiences. I was going to cite some articles here that you could read, but they were all written by the same person. So, if you’d like to learn more about competing agendas during field trips and children’s field trip experiences, I highly recommend acquainting yourself with the work of Dr. David Anderson from the University of British Columbia. Interpreters. We’re the life of the party! We’re the people everyone wants to be around! We’re fun, spontaneous, crazy, caring, kind, and compassionate. We want to save the world. But how many of us have thought about ourselves? Have taken the time to remove ourselves from the spotlight, stepped off the stage and looked within at our mental health? There’s a lot of pressure on performers both internally and externally. We expect ourselves to give 110% of our energy to the audience and to know the answers to everything. Interpreters are often ‘on’ more than usual because we think that’s what people expect of us; and we often expect it of ourselves too. Who doesn’t want to be centre stage doing good and saving the world? However, all those hormones coursing through our bodies during a presentation (and/or before, and/or after) can have lingering effects unless we purposefully set out to care for our mental health. The most well-known ones are adrenaline and cortisol. The adrenal gland, which releases the hormones, has kept primal and modern humans alive for over 2 million years. So aren’t they good for us? Definitely. They are part of the sympathetic nervous system (SNS) which helps the body respond to a perceived threat. Commonly known as the fight or fight response. Our pupils dilate making our vision better. Our brain become focused and engaged. Some of our body’s systems are suppressed which allows us to work harder and last longer. New interpreters may notice this experience more, but even seasoned presenters will feel that boost of adrenaline before walking ‘on stage’. Traditionally, when the threat is gone, the parasympathetic nervous system (PNS) takes over from the SNS. Norepinephrine is released, our bodies start to calm, muscles relax, pupils return to their pre-stimulus state, and our heart rates slow down. The adrenaline and cortisol decrease to natural levels. We all know that feeling after leading an all-day hike, finishing an amphitheater program or simply after summer programming is done: that sigh of relief! In our modern, fast-paced world, we don’t always give the PNS time to do its job. We go from a one-hour long program to a campfire program. Or from an all-day hike to home where the adrenaline continues to keep us going to get everything done. And if the PNS isn’t doing its job, stress is a result. Most of us know the physical effects from too much stress: fatigue, high blood pressure, bone loss, headaches and muscle weakness. We may not, however, connect these hormones to our mental health. Sustained periods of adrenaline and cortisol, without the relief of norepinephrine, can lead to mood changes, sleep disruption, lowered concentration and irritability. And these can spiral into anxiety and depression. I should know. I suffer from depression. I have for decades. While I suffer from clinical depression, I am all too aware of how easy it is for me to spiral when I’m not taking care of myself. I help control mine with antidepressants but every avenue I pursue make me feel better! Get off the stage long enough to go for a walk, meditate! Step out of the limelight to talk to friends, attend a yoga class. Use your interpreter research skills to learn more about mental health or look up healthy recipes to try! Pause in your busy day to simply take a breather. Walk away from your job for a few hours and do other things you are passionate about. I know saving the world is important…but saving yourself if equally as so!! As someone who lives with a mental illness, Stephanie is an advocate for all things that makes our brains healthier! Including opening up about her depression. But never fear, canoeing, reading, yoga, walking, friends, Eliza her dog, rainbow sunglasses, travelling and good food all contribute to a balanced Steph! Is it enough to respect nature? Will our technologically dependent urbanized society interfere with our children’s ability to bond with nature? How can we get more people to connect to the rhythms of the earth? How important is ‘dancing’ with nature to nurture the ‘wild’ within? These are some of the questions I wondered as I wandered into my thesis on ecological education. The beat of my own drum advocates for the ideal of teaching reverence for nature. Reverence not only entails a deep respect but also requires wonder, awe and love. I believe that those who develop a reverence for nature will honour the inherent interconnectedness of all things and gain a healthy sense of belonging. This emotional bond to the earth heals us and is essential if we are to become stewards of that which brings us life. 3. Knowing one's connection to the human community. Each lesson is comprised of three pedagogical components for teaching reverence for nature: 1) Rouse Interest; 2) Relate; and 3) Reflect. A different twist to the traditional three Rs that our education system has focused on in the past. But as my research attests, children will not commit to reducing, reusing and recycling if they have not developed a reverence for nature. If pressured to do so before that relationship develops, an eco-phobia could take root instead. 'Rouse Interest' activities provide the motivational set by building enthusiasm and focusing their attention for the direct experience in nature that is planned next. These activities relate to the first way of knowing, 'Knowing oneself deeply', in that they involve opportunities for students to get to know what they are interested in and prepares them to focus on their personal interest when they interact with nature. To rouse students' interest, these activities try to encompass the whole child by encouraging the use of the body through physical action, the mind through the sharing of knowledge, the spirit through the sharing of emotions and passions. 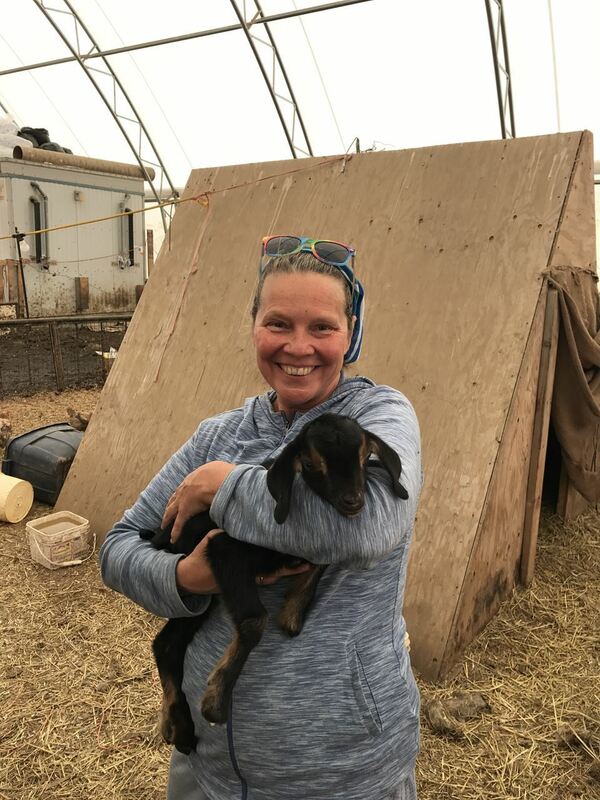 The objective is for students to connect with one's true self so that they are better able to connect with other students, other beings in the wild and the wilderness itself. Interpreter Brad Muir rousing interest before a Wolf Howl at which participants will directly experience what it is like to be a wolf exploring the park in the dark. The 'Relate' activities provide direct experiences in nature in order for students to foster empathy with ecosystem members and to have students gain a sense of their own interconnectedness with nature. Spending time interacting with nature provides opportunities for students to experience the wonder and awe that nature inspires. The main goal for the 'Relate' activities is to give students many opportunities to build a relationship with nature. 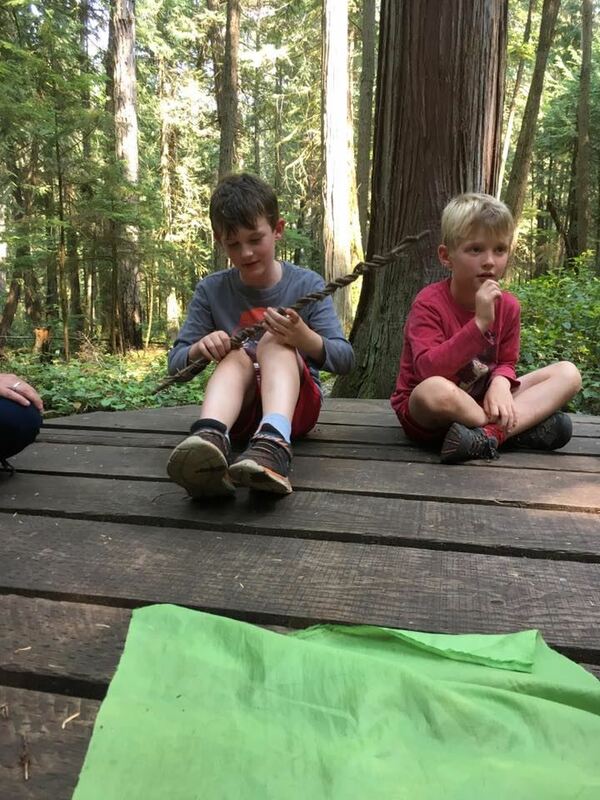 These activities relate to the second way of knowing, 'Knowing one's connection to the living Earth', because they provide direct experiences in nature that involve sensory exploration and personal discovery. The experiences of wonder and awe and the feelings of deep respect and love that students develop will eventually lead to a reverence for nature. The 'Reflect' activities in the teacher guide process what they learned through creativity, imagination, and solitude and provide them with the opportunity to share and inspire others. If children are able to reflect on how nature connects with their own inner nature, the bond they have with nature will be strengthened. In getting to know nature at an intimate level, students are able to see that their place in the universe is to live as part, not apart from nature. If personal connections are made then students will welcome opportunities to conserve what has helped them feel whole. Because this section involves creative activities for students to share their inspirations to educate others in the community, it thus incorporates the 'Knowing one's connection to the human community'. "To communicate wonder, we must have a spirit of wonder. A leader who is filled with wonder, joy, and love for the natural world draws out these good feelings in others. In the presence of such a leader, people eagerly want to experience these same feelings for themselves.....An individual whose heart is filled with love and reverence for nature can make ecological attitudes come alive for others as nothing else can." Let’s practise listening to the common pulse of our one and only planet earth, learn to dance to its wondrous rhythms with reverence and invite others to join in the celebration of life. This article is derived from Marie's thesis on Teaching Reverence for Nature: An Eco-philosophical foundation for the Saskatoon Laurel Grasslands Ecological Education Guide and Kit. If you are interested in this research and would like an electronic copy of it, contact her at ecodreamer(at)icloud.com. I just finished a thought provoking online course called Reconciliation through Indigenous Education and it inspired me to reflect upon how the field of interpretation could contribute to reconciliation with Indigenous peoples. 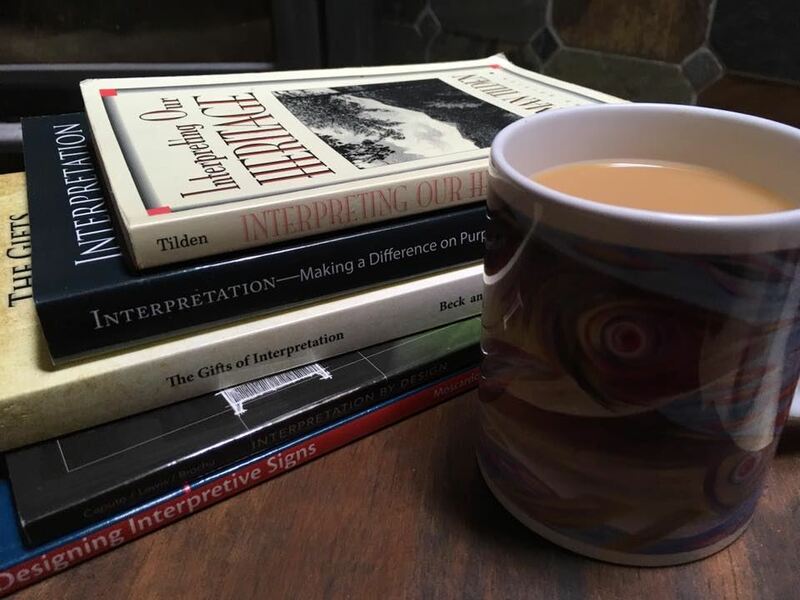 I humbly admit to knowing very little about this topic, but I wanted to share my key learnings from the course and hope that this diablog will spur some conversation on the topic within the field of interpretation. I have very little experience in working with Indigenous peoples and look forward to hearing from others on this topic. I’ve summarized my learnings into three R’s of Reconciliation: Respect, Relationships and Reconsidering, and have incorporated ideas we covered in the course, as well as examples that I know about from my over 30 years’ experience in interpretation. Any reconciliation efforts interpreters are involved in have to show respect to individual Indigenous people, as well as respect for their different cultures. One way to show respect is by starting interpretive programs with an acknowledgment of the local nations’ connections to the land where the program takes place. We did this in 2017 in Lake Louise and my interpreters admitted it felt somewhat awkward, but that it was very worthwhile. Incorporating Indigenous peoples’ languages in place name signs also acknowledges their connections to places. While I have trouble pronouncing them, I love seeing the Indigenous place names on the signs in Pacific Rim National Park Reserve. I think respect could also be shown through working closely with Indigenous peoples to develop interpretive programs together and not merely inviting them to do a dance or other potentially superficial demonstration. I’ve been told that Elders and Knowledge Keepers are usually very happy to be invited to share their stories at a local site; what amazing and authentic first-hand experiences this would provide for visitors! And I think it would be even better if the visitors were encouraged to share what the Indigenous peoples’ stories mean to them. As a non-Indigenous person, a.k.a. a settler, I realize that I need to develop relationships with local Indigenous people before working with them to offer Indigenous interpretation for visitors to the Lake Louise area. I have some experience with Rocky Mountain House National Historic Site and am impressed with what they have achieved; through an agreement with the local Metis group, authentic and very popular Indigenous interpretive programming is offered at the site. My colleague in Jasper National Park has just been involved in setting up an Indigenous peoples interpretive advisory committee and I’m excited to hear more as they get it going. And I noticed online that the Sitka Tribe in Alaska has entered into a collaborative partnership with the US National Park Service to co-manage the site’s interpretive program. I’m sure there are many other great examples out there and I’m also sure that they didn’t just happen overnight, but are a result of much time and effort put into relationship building. This is the toughest and most important of the three R’s. Before interpretation can contribute anything to reconciliation, the history of sites need to be reconsidered and tough questions asked, such as “Whose story is this?” and “Where did this information come from?” In many cases, stories being shared in interpretation will need to be repositioned to include multiple perspectives. For example, many site histories start with settlement, when the stories should be starting with use of the land by the Indigenous peoples. I have been experimenting with a new approach to interpretation known as Dialogic Interpretation and I think it offers an ideal means for considering multiple perspectives. For example, Yellowstone Forever, the nonprofit group associated with Yellowstone National Park, engages clients in dialogue on the controversial topic of bison on the landscape. Visitors debate the issue from various perspectives including those of the local ranchers, tourists, wildlife conservationists, state, park and First Nations groups. Interpretation that aims to provide visitors with different viewpoints, rather than the one single perspective of the agency, seems ideally suited towards reconciliation efforts. Reconsidering the content and how it is shared in interpretation may help towards reconciliation; however, more importantly, interpreters and others need to rethink the predominant colonial viewpoint that North American society is based upon. For Indigenous and non-Indigenous people to be equal partners in interpretation, roles need to be reassessed. Colonials or settlers, like myself, have to learn to share the stage and be less paternalistic in our approaches to interpretation. For the past few years I have been excited to guide my interpreters in using interactive approaches in interpretation, i.e., dialogic, participatory and other forms of visitor-centred interpretation. I believe that these collaborative techniques are ideally suited to reconciliation; they encourage sharing and respect for all participant’s views and take the interpreter from the “sage on the stage” to focusing on “facilitation for inspiration.” I don’t think interpreters need to STFU but need to be “the guide on the side”; this means being visitor-centred, making room for all stories, and involving people in hands-on and meaningful experiences that will encourage them to make up their own minds about the place and what it means to them. Upon reflection, I believe there are many ways interpretation could contribute to reconciliation and the few ideas I have presented here merely scratch the surface of possibilities. Indigenous partners need to be treated with respect, relationships need to be nurtured, and sites’ history and stories need to be reconsidered from multiple perspectives, and on top of it all, the purpose of interpretation and approaches we use need to be reconsidered. I’d love to hear from others- How do you think we are doing with reconciliation through interpretation and what else could we be doing? I live in Canmore on the traditional land of the Tsuu T'ina, Niitsítapi (Blackfoot), Stoney and Ktunaxa. I completed my doctorate in 2015 after studying the concept of inspiration in interpretation. As the Interpretation Coordinator with Parks Canada in Lake Louise, I strive to combine theory and practice to improve interpretation and help connect visitors to place in ways that are meaningful to them. In my spare time I run my own consulting company, InterpActive Planning and Training. The course I took was called Reconciliation through Indigenous Education and was offered by edX in conjunction with the University of BC. For more information see https://www.edx.org/course/reconciliation-through-indigenous-education. And, as the definitions vary, so does the quality of the people delivering it. While there are a lot of amazing non-certified interpreters out there, what really qualifies a person to call themselves one? How does an employer know they are hiring the best? How does a client or visitor know they are getting a quality product? That’s where certification comes in. My own journey as an Interpretive Guide began with certification. That’s because I work in a Canadian National Park and Parks Canada recognized many years ago that it needed to establish a level of proficiency for people who called themselves guides in national parks to ensure their visitors were safe and had a quality experience. The two main organizations that provide the certifications that Parks Canada recognizes are the Association of Canadian Mountain Guides (ACMG) and the Interpretive Guides Association (IGA). The route I chose was with the IGA. "To be certified as a Professional Interpreter means to have a achieved a level of knowledge and proficiency that one can really hang their hat on." It all began in 2016. Recently laid off from a job as a visitor services and communications staffer for Parks Canada, I was floating around wondering what I should do next when a friend invited me to guide for her company that upcoming summer. Since I lived in Jasper National Park, and that’s where the guiding company operated, I needed to become certified as an Apprentice Interpretive Guide with the IGA. I wasn’t unfamiliar with the IGA. I had done their basic certification in 2012 in order to work as a backcountry wrangler for my horse outfitting friend. With my Parks Canada background, the basic certification process wasn’t difficult for me, and I expected the Apprentice Interpreter certification to be similarly simple. Boy was I surprised! The Apprentice Interpreter course introduced me to a whole new way of looking at guiding. It’s where I learned how to really be a guide - an Interpretive Guide. There is a process to it. And a level of professionalism that’s required to do it well. What I also discovered that first summer of interpretive guiding was how much fun it was. And how lucrative it can be if you are good at it. The next step on my journey was to complete the IGA’s Professional Interpreter certification. To be completely truthful, the primary reason I signed up for the course was simply to improve my knowledge and skills. I didn’t think much about the certification itself or its value. It wasn’t until I did the exams that I got it. This was no walk in the park. It takes practice, effort, knowledge and skill to become accredited at this level. To be certified as a Professional Interpreter means to have a achieved a level of knowledge and proficiency that one can really hang their hat on. It means you have invested time, energy and effort into honing your skills and becoming really good at what you do. It means you have taken it on as your profession and your means of earning a living. Being able to call myself a Professional Interpreter, and to back up my claim with certification from a recognized, credible organization has improved my confidence, helped me command a better price and allowed me to join a growing community of people who call Interpretive Guiding their career. It has been a fun journey - and it’s not over yet. 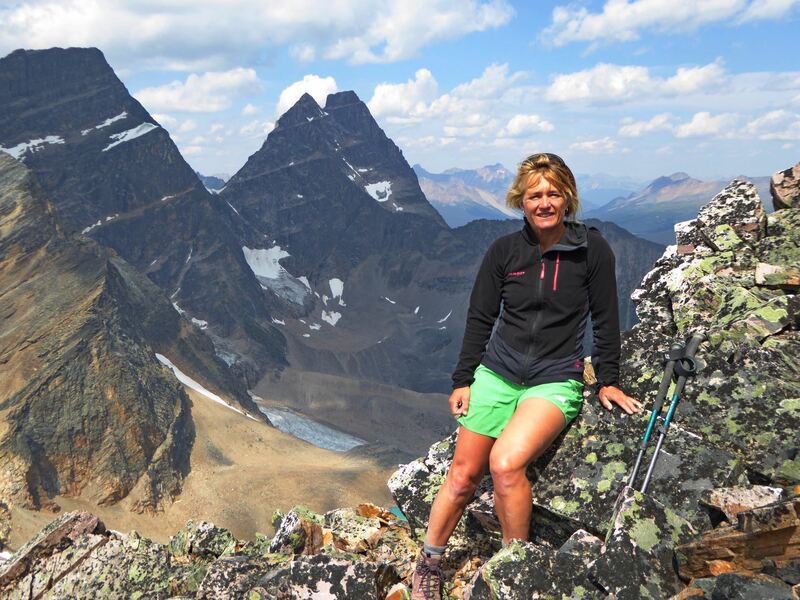 Wendy Niven is a freelance interpretive guide, web developer and outdoor enthusiast based in Jasper, Alberta. 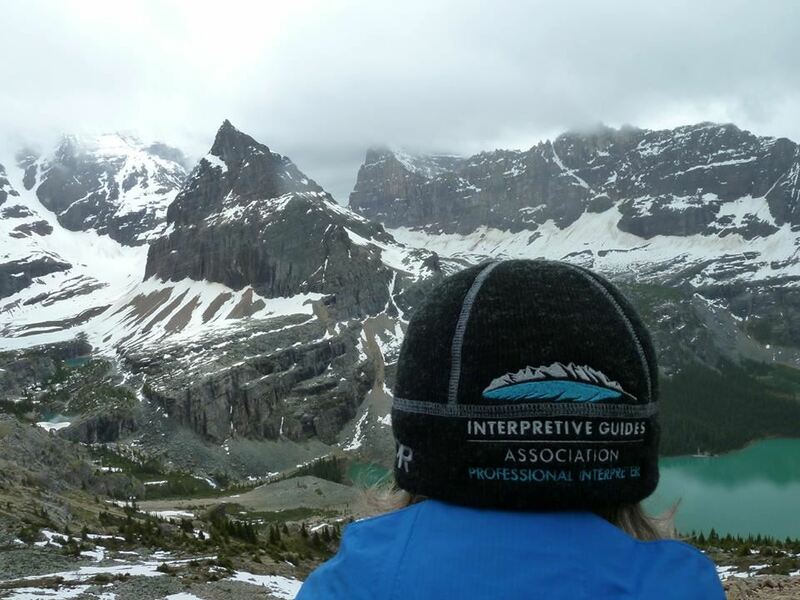 To learn more about the Interpretive Guides Association and their certification programs, visit www.interpretiveguides.org.